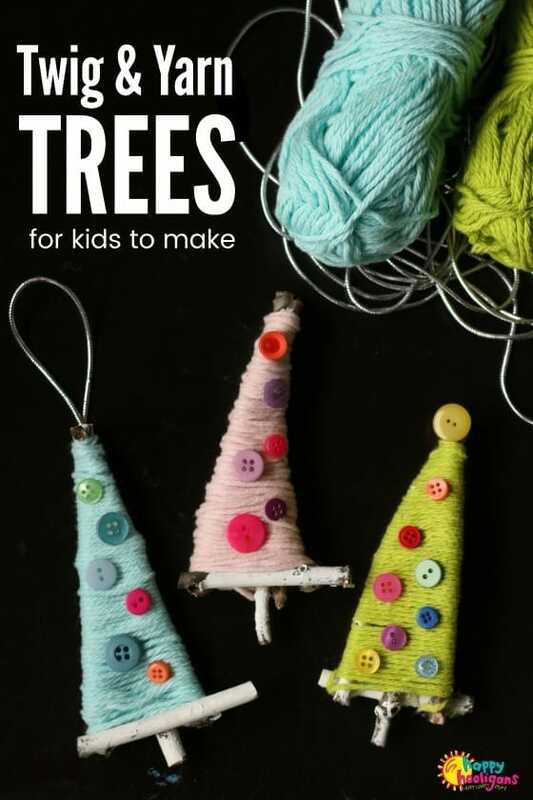 These YARN AND TWIG CHRISTMAS TREE ORNAMENTS are easy for kids of all ages to make. All you need are some twigs from the yard, a few buttons and some scrap yarn to make them. You know it’s December when my daycare hooligans crank out the Christmas crafts at the rate that they are these days. Our latest Christmas craft is an adorable and super-easy twig and yarn Christmas tree ornament. 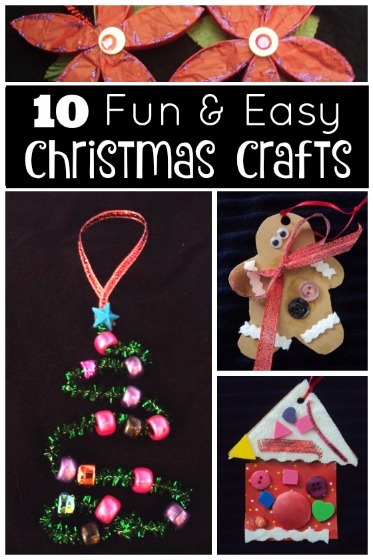 We’ve made a ton of little Christmas tree crafts here in my daycare over the years. In fact, a few years ago, this same bunch of kids made these wool-wrapped wrapped Christmas trees, but their fine-motor skills and co-ordination is much more developed now, so today’s yarn and twig trees look a little more sophisticated. The toddler version of these trees is adorable, so by all means, go ahead and do it with your toddlers and preschoolers. 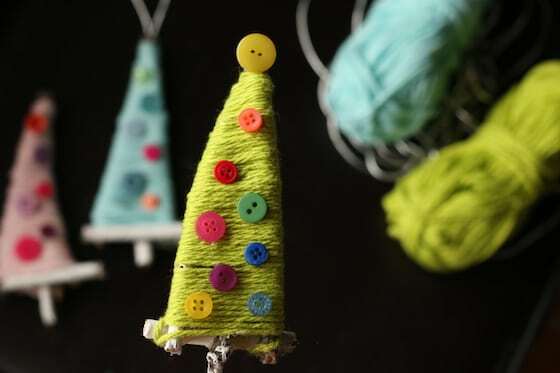 If you have older kids, they may want to be more deliberate when wrapping their yarn, which will provide a surface for gluing some colourful button “ornaments” on their trees. 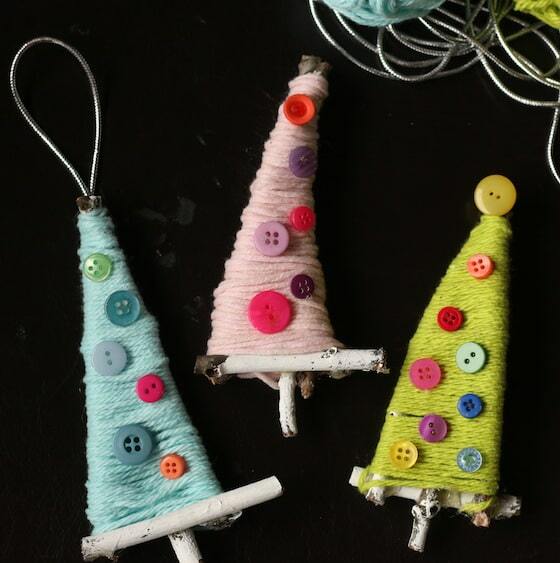 I just love the colours of yarn the kids chose for these ornaments, but they’d look beautiful made with neutral coloured yarn and natural wooden buttons as well. White yarn on the white twigs would look stunning with colourful buttons too. If you’re going for more traditional colours, dark green with red buttons or wooden buttons would look great. Start with a twig hunt in the yard. It’s a good excuse to get outside and get some fresh air. We have a ton of twigs in our yard at the moment because we’ve had a windy fall, so finding enough twigs for this project wasn’t a problem at all. You’ll want sturdy twigs, a little thicker than a pencil. We used acrylic craft paint to paint our twigs because that’s our paint of choice whenever we’re crafting. 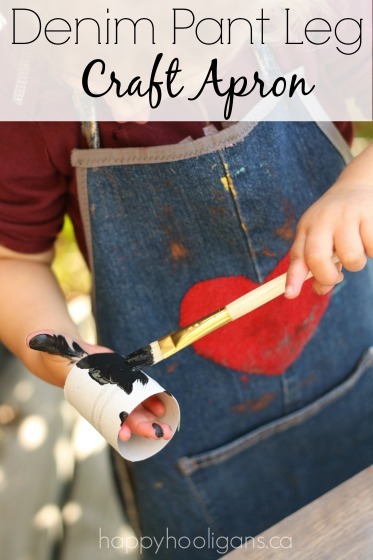 You can use poster paint for this step if that’s what you have on hand. Don’t worry about perfect coverage with the paint. I think it looks nice when some of the real wood is showing. It gives the ornaments a rustic look. 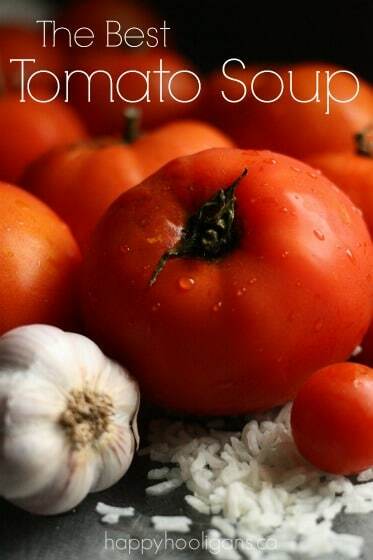 Next, you’ll glue your twigs together. You’ll want to use your hot glue gun for this step so the twigs really hold. 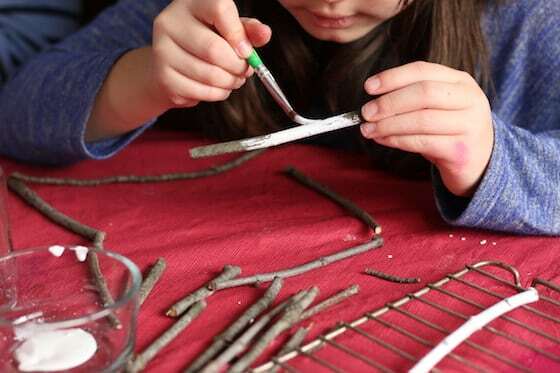 If you use a low heat glue gun, you may find the twigs separate when the kids start wrapping their yarn around them. Starting at the top of your twig, begin wrapping your yarn, being sure to trap the beginning tail of your yarn as you wrap. 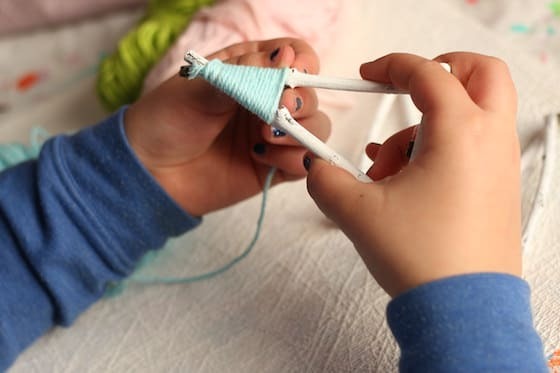 Let the kids know to not wrap their yarn too tightly as this can cause the twigs to warp or even disconnect. 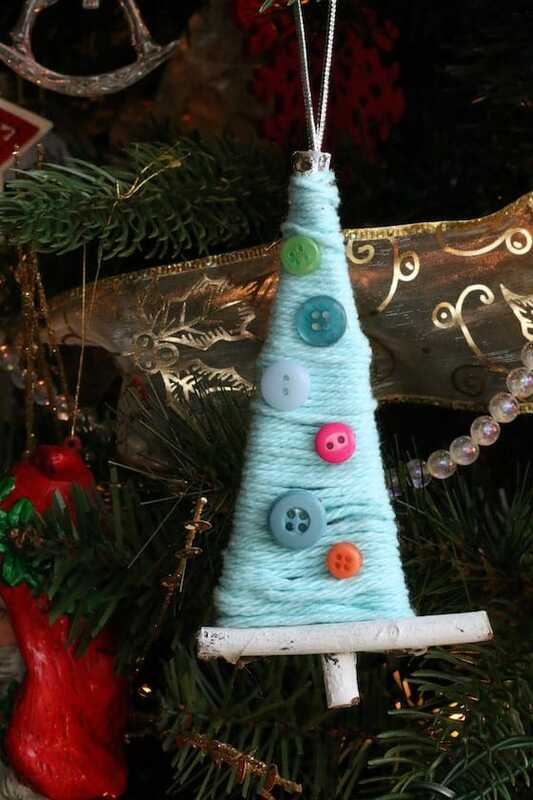 Trim your yarn when you get to the bottom of your tree, and stick it in place with a drop of hot glue. 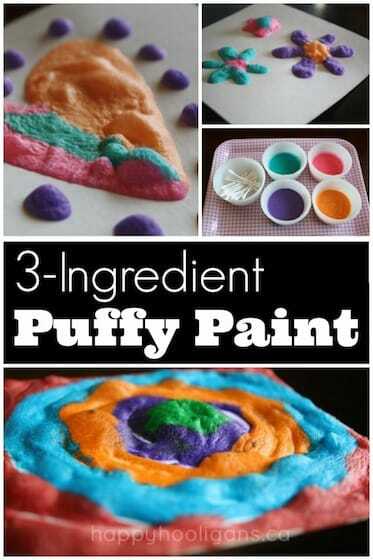 Now your kids can use a low-heat glue gun to attach their buttons. Finish by looping a length of metallic thread under a strand of yarn at the top of the tree, and secure with a knot.